I don't know about you but over here we are huge chocolate fans and even bigger chocolate cake fans! The great thing about chocolate cake...duh...it's delicious. The worst thing about chocolate cake, it's not the healthiest of food choices. Well, what if we changed that and gave you a chocolate cake recipe that is protein packed and a delicious alternative to your usual cake? Since we like you so very much, here is our Healthier Delicious Chocolate Cake Recipe that we hope you will enjoy as much as we do. Preheat your oven to 320 F.
Combine your cocoa, coconut flour, baking powder, cinnamon and sea salt well in a medium bowl. Next add eggs, honey, vanilla and coconut oil. Mix all of your ingredients together until smooth. Pour your batter into a small baking pan sprayed with non stick spray. Eat alone, with your favorite frosting, or have warm with a dollop of low fat ice cream. Yum! Awww man. I am trying to be good! This looks so good. It is good...it's healthier too though! This just sounds amazing!! Love that you have made it healthier, too! Thanks girl! It's delish. If you try it let us know what you think. 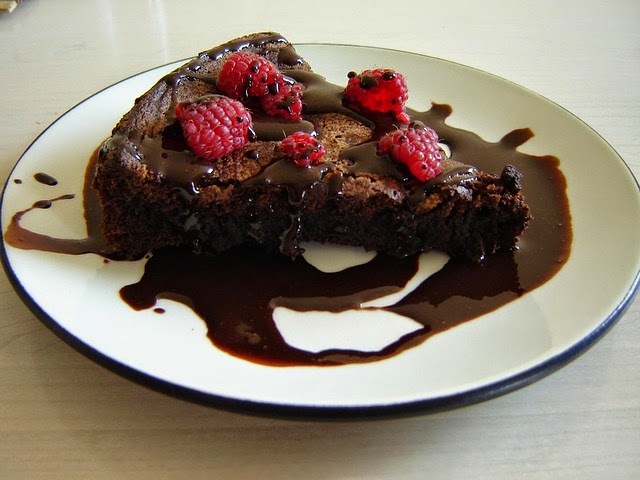 I mean healthy chocolate cake that looks that good???? I am all over that! and it tastes great too! It's hard to have just one piece. This sounds so yummy! And looks amazing! I am a chocolate addict so I will definitely give this a try! It looks amazing! Oh this looks absolutely yyummmmmmy! It is! and healthy...you can't beat that!